Remodeled 2bed/1ba house, pet friendly, dock slip available for EX-$65 a night. A quaint lake house with nice views of the surrounding mountains and a peek of Bass Lake. Our home just went through a remodel in December of 2016 including but not limited to; all new furniture, beds/mattresses, linens, smart TV's in every room, etc. Sip some coffee in the morning on the spacious back patio with sensual views and relax in the stillness and get close to nature with sounds echoing from the lake. This charming house is close to restaurants, market, the beach, docks, and family-friendly lake activities. Appealing to couples, solo adventurers, business travelers, families (with kids), big groups, and dogs, all are welcome. Hi there, Lani and I live in San Diego with our 7 yr old daughter Kyndal, and our 5 year old son Caden. We enjoy all the beauty SD has to offer, while trying to keep up with our kids busy schedules. I grew up in Napa Ca and Lani grew up in SD, as well as Spokane WA. We love going to our 2nd home in Bass Lake as much as possible. Thank you for looking into our house at Bass Lake. I've been going to Bass since I was born in 1979. I've spent summers at Bass as a kid visiting my grandparents, skiing behind friends boats, jet skiing, fishing, hanging out at the Falls, pines ice cream store, etc etc etc. It's my favorite place on earth! 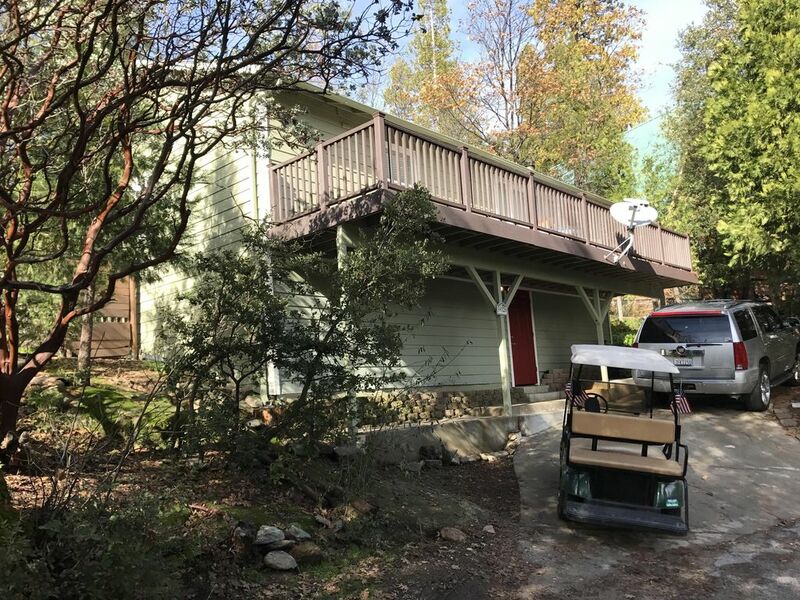 We are happy to rent this fully remodeled (2016) home to you and your family, so you can have the opportunity to experience the same happiness I have at Bass Lake. Enjoy! Land line in living room for local and emergency 911 calls only. Wall unit in living room. 2 fans for each bedroom window during the summer. The fans are stored in the hall closet. Wood stove in living room heats the whole house. However, each room has an electric room heater. All bed linens are included and washed each time. Flat bottom drip machine. We have filters for you. Table expands to seat 6-8. 3 new (2017) smart TVs in every room. We have cards, and a couple basic board games to enjoy. Hello! We have a boat slip for rent based with limited availability. Email with your reservation if you would like the use of our boat dock slip. The cost is $65.00 per day in addition to your daily rate. If your a boater, I highly recommend this option as it is in line with daily launching and storage fees from The Pines Village without having to pull in and out everyday. Cabin worked out well for my family of four. We stayed in November. It was quite chilly but the floor heaters in each room and fire place warmed the place up nicely. Kitchen and bathroom were well stocked with necessities. It is within walking distance of store, Restaurant and lake. It was nice to have smart TV and internet. We ventured into Yosemite Village which is about 1.5 hour drive. Great location very near town. Beautiful surroundings. Very clean and comfortable with very strong Wi Fi reception for on line workaholics. We enjoyed our stay and had a pleasant experience.The place was very clean when we arrived. It was very warm during the day and the only air conditioning was in the living room. The bedrooms were a little warm at night although ceiling fans and window fans were provided. Other than that we had no complaints. The cabin was perfect for the four of us with our dog. We enjoyed bbq- ing on the deck and the short walk to the dock. We met the owners who were best nice and responsive. We hope to stay in this cabin when we come again! Thank you for the fun vacay, we won't forget it!! My daughter's and I (plus an occasional stray cousin!) stayed for 3 nights and really enjoyed how peaceful and nestled away from the main Bass Lake roads this cabin is. The updates made it a very comfortable stay, and we loved the decorations and fun welcome basket of goodies. The grill out back was great, and the deck views were stunning. We even had s'mores by the fire pit (not pictured) which was an added bonus! The ice maker doesn't work, so get a bag on your way in! We hope to return in the future!